soo... after doing some work, i came up with my own "blog award." 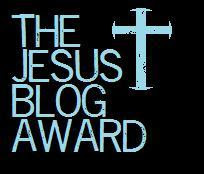 It will be called the "Jesus" blog award, how about that!?! And it will be given to anyone who has an obvious love for Christ. comment and tell me what you think! Hey I was just wondering what all these "blog awards" are? And I was also wondering why I don't have any... Naw, just kidding!.. But I was thinking about starting a "blog award" thing to give it out to people, but I don't really know how. So can anyone give me some info.? hey, on the poll you can select more than one answers, and if you have any other ideas, please give them!